We are having another baby boy! That will make me a mother of three boys. Oh boy! It seems like a big deal. It’s not really, though. I can name so many people who have three sons. Three of my dad’s siblings have three boys. Even my grandmother had 6 boys in a row before a girl came along! A few families I grew up with also lacked a female child. Life with three boys (maybe more, maybe also with a girl in the future) sure will be exciting! I would be lying if I said I didn’t shed a few tears after learning it was a boy and not a girl. It was no secret that I wanted a girl! After I heard, I knew I was going to need a good cry to get it out of my system and then I would be fine. I thought it would wait until I got home, but I actually had my cry when the tech left the ultrasound room to show the photos to the doctor. And since it wasn’t at home, it was just a little cry. But I think it still got it out of my system! No further cry was had! I am all good with it now. I think what helped was the fact that we have the perfect name picked out (and have for some time; we are planners). This gives the baby and identity and a place in our family instead of just being some boy hanging out in my uterus. The thought of having three boys is a little overwhelming and makes me feel tired for my future self. But it will be an adventure. And adventure I am looking forward to! And if he is as cute as those other two up there in that video, it would be hard to not love him! Of course when you think of three boys, things like the Three Stooges come to mind. Here are some other groups of famous boys/men that come in three that make me smile. The butcher, the baker, and the candlestick maker. Representing the nursery rhymes of our childhood. Rack, Shack, and Benny. AKA Shadrach, Meshach, and Obednigo, three guys who stood up for what they believed in and experienced first hand what our all-powerful God can do. Snap, Crackle, and Pop. The mascots for the cereal that can be turned into a deliciously sticky treat! Fun fact: I never liked eating Rice Krispy squares when I was little because they made me sticky. The Three Kings. Or three wise men. Or three maji. Probably not three, but whatever. The men who were chosen be among the first to welcome Jesus to this world. How special! DC Talk. The music of my youth. My first CD. Makers of music I never tire of listening to. Everybody always seems interested in how pregnant women are feeling, so here is how I am doing. I am feeling great! I still have that pesky nasal congestion, but after it sticking around for the entirety of two other pregnancies, I am kind of used to it. Only a few more months until it’s gone! Sleeping is still mostly comfortable, I can still get up off the floor while holding Victor after nursing him in the middle of the night (yeah, I just plop myself on the floor beside his crib instead of going to the couch in the living room), and heartburn hasn’t kicked in too terribly yet. Well, I never get it bad anyway. Even later in my pregnancies I never feel a lot of the discomforts that are so common for a lot of women, like being kicked in the ribs or other places. I am doing well, and am enjoying being pregnant. 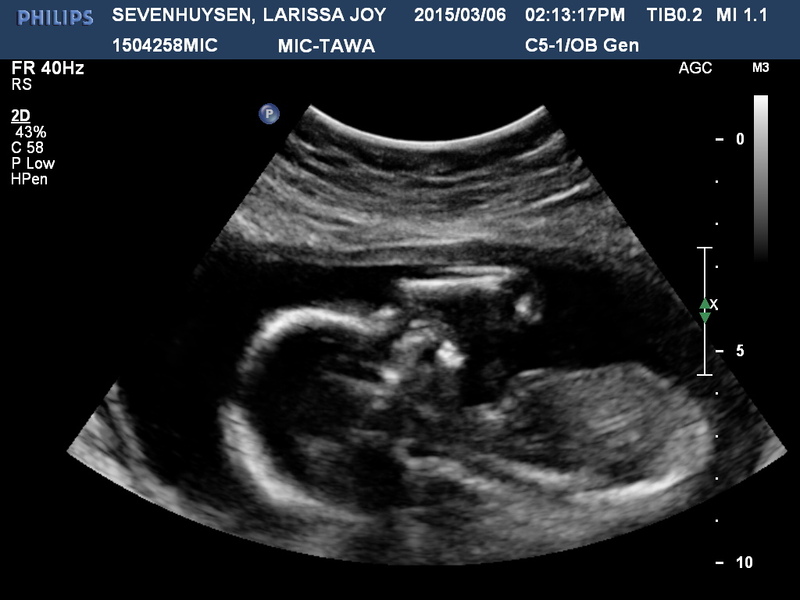 This entry was posted in Life and tagged baby 3, personal, pregnancy on March 21, 2015 by Larissa Sevenhuysen. This past weekend I turned 28. 28?! That’s nuts to me! Didn’t I just graduate? Didn’t I just move out of my parents’ house? I’ve actually done a lot with my 28 years. Just in the past decade I’ve travelled to 3 continents (other than North America), made the very first move of my life to a brand new city, lived on my own for 3 years, got married, had 2 children (with another on the way! ), and become a home owner. A lot of people can’t say that much at 28. I am so thankful for where my life has all led me. The weekend was quite a good one. Jordan and Amy stayed with us Wednesday and Thursday night since they had a conference in town, and we celebrated me with an ice cream cake. Yummy! And our friend, Kate, was working in town on Friday so she spent that night as well. Although not birthday-related, the visits were special! Friday morning some friends and I made a huge batch of wareneki together. I was glad to have something to do that morning to take my mind of the ultrasound I had booked for that afternoon. I was nervous about it! I was hoping for a sweet birthday gift of finding out the gender, but that was not to be. But not to worry. I have to go back next week because they couldn’t get clear measurement of the baby’s heart either. Surprisingly I’m not nervous about that. 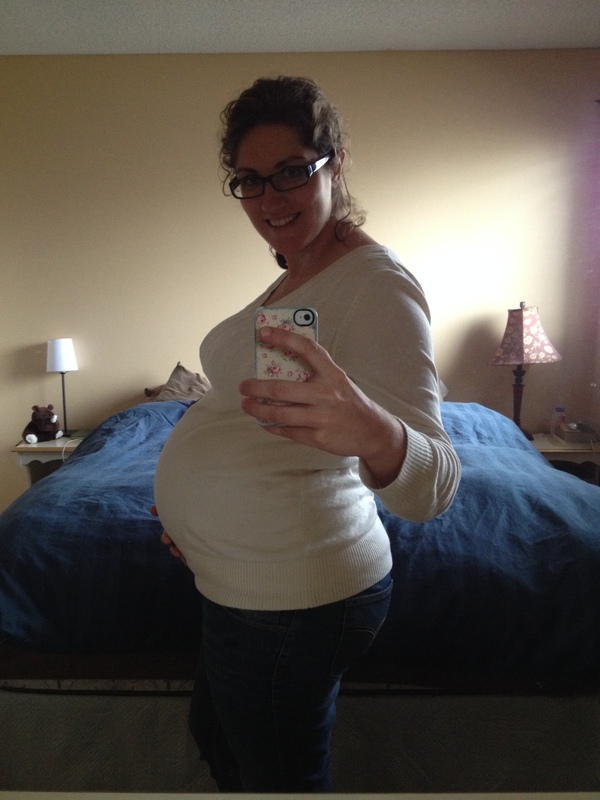 I actually had a couple weeks at the beginning of my second trimester where I was anxious about the health of our baby. Only for the reason that I’ve had 2 perfectly healthy pregnancies and babies; am I allowed to have another? But that anxiety melted away into just nervousness for finding out the gender. Now, even after hearing that something needs to be looked at again and they also couldn’t see the gender, I am feeling neither of those feelings anymore, which is great! Saturday morning I had brunch with the ladies from our small group and in the evening my boys and I went out for dinner. The day was also, of course, interspersed with calls and texts from family members. It was a wonderful day! I tried adding more photos, but it isn’t working for whatever reason. Check back again later if you like! This entry was posted in Life and tagged baby 3, personal, pregnancy on March 11, 2015 by Larissa Sevenhuysen. This is it! Today is my due date! I’m not surprised I made it this far, and I kind of expect that I will make it past 41 weeks. I hope I don’t, but so far there isn’t much saying this baby is coming soon. My days lately have gotten into a nice pattern. We wake up, have breakfast, then play until nap time. Calvin has been spoiling me with 3 hour naps, which is plenty of time for me to get something done then have a good nap myself! I have been trying to do something different every day, like clean the bathroom, vacuum, tidy the kitchen or do laundry, so the house is fairly ready at any moment. When our naps are done, we have lunch then tackle any errands that need to happen or play in the backyard. Then it’s supper time followed by bed time. Lazy, but good days. I am looking forward to a whole winter full of them! Playing the waiting game this time around isn’t quite as boring as last time, since Calvin is around, but the anticipation is just as big as exciting! Hopefully this will be the last post you see with a photo of me with a big belly. Cute newborn photos from here on out! And don’t forget…there is still time to place your guesses in our baby pool! 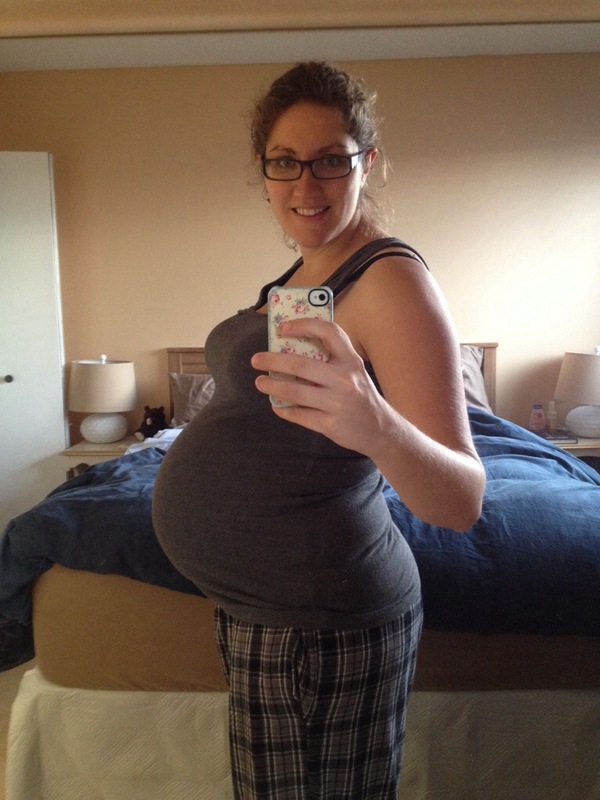 This entry was posted in Life and tagged baby #2, pregnancy on October 21, 2013 by Larissa Sevenhuysen. I started this post last week, but never uploaded it because I never took a photo. And I don’t feel like rewriting the whole thing, so I will just post this with a few added edits to make it current. I am officially in my 9th month of pregnancy (and now considered full term)! Honestly, I probably feel as good as one can this far in. No aches, pains, or fake cramps. It’s just hard to bend over to pick up Cheerios off the floor. I wake up a couple times each night to use the bathroom, and normally I fall back asleep right away, so I am not even that tired. That, I know, will change once the baby is in my arms instead of my uterus. Things I have left to do are set up the pack and play and sort the newborn stuff I have. It probably will take approximately one nap time, but I have yet to have the nesting urge hit me hard (clothes sorted but not washed…does that really need to happen? ; pack and play is not set up because it is our door stop because our door doesn’t latch and something has to keep Calvin out…gonna have to figure something out). Oh, I should probably also get some food in my freezer. Somehow, last time, I ended up with meals for 6 weeks post delivery between what I made and what my mom made (okay, mostly my mom)! It was amazing. Can I just say I am glad this baby is coming in the season it is? It is way easier to put together wintery foods for the freezer (I have thought about what to make and have come up with meatballs, chili, lasagna and stew…sounds like I need to get a lot of ground beef!). I have mixed emotions about this delivery. I don’t know whether I should feel nervous, scared, or excited to go into labour! With Calvin I was induced at 10 days over due (read about that here), and I am hoping I don’t have to do that again. But thinking about going into labour, I feel like a first timer! Will my water break? How fast will the contractions come? How strong? Will it be uncomfortable to drive to the hospital (fortunately for us, our move brought us just 5 minutes away from it)? What if my labour goes super fast? How will I know when to go in? At my 36 week appointment, my doctor informed me they would like to induce me again, just because I was fairly quick last time, they don’t want me to wait to go into labour then not get to the hospital in time (but who doesn’t want an awesome “fireman delivered my baby!” story?). She seemed a little more into letting me go into labour naturally once I told her I am 5 minutes from the hospital. But it is hard to say no to convenience sometimes! If I know in advance, then I can for sure have somebody ready to watch Calvin, and my parents won’t have to know at the last moment when to come. As for who we have to watch Calvin, it would be our downstairs tenant and/or Amy. If it’s during the night, we can let Calvin sleep and just let the tenant know and Amy can come in the morning. If it is during the day, things get a little trickier since the tenant works and Amy doesn’t have a car. The doctor probably wouldn’t look too favourably on me driving to go pick her up while in labour when she barely thinks driving 5 minutes to the hospital is a good idea. And also, what about waiting the half hour for Tim to come from work if it happens during the day? Is that too long to wait? Maybe I should let them induce me! And then there is the uncertainty of knowing what the hospital is like. In this case, it’s not like being a first timer because you know what options are out there. I know what was available at the hospital in Victoria, and I don’t know exactly how this hospital (which for some reason doesn’t do in person tours, just photos online) will compare. But in the end the baby will be here and it will be wonderful. Here are more thoughts I’ve had since last week. 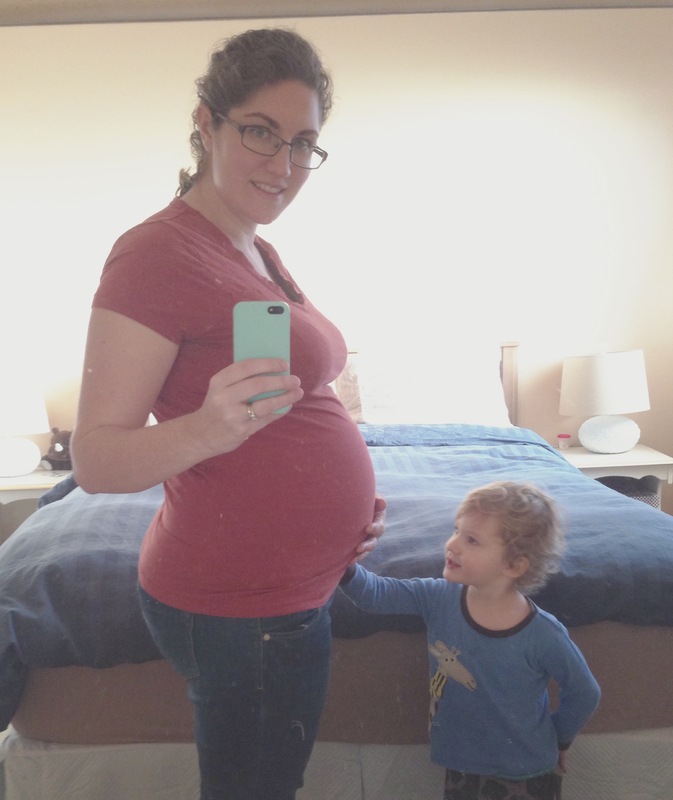 I have been hearing a lot lately (mostly in my birth club on Baby Center) about the “4th trimester” where women basically stay at home in a little bubble because they are afraid to let people hold their baby and be exposed to germs and such. Some moms are even hard pressed to let their half a year old babies be held by other people! Since these women in my “club” are due at Thanksgiving, give or take a couple weeks, there are so many who say they don’t want to go to family gatherings because of the reasons stated above and think people would be rude to want to hold their baby. These same people don’t want to accept visitors at the hospital or even at home for 2-4 weeks after. For me, personally, this is ridiculous. I am not the kind of person who looks for reasons to leave the house, but I like hanging out with people, family especially. 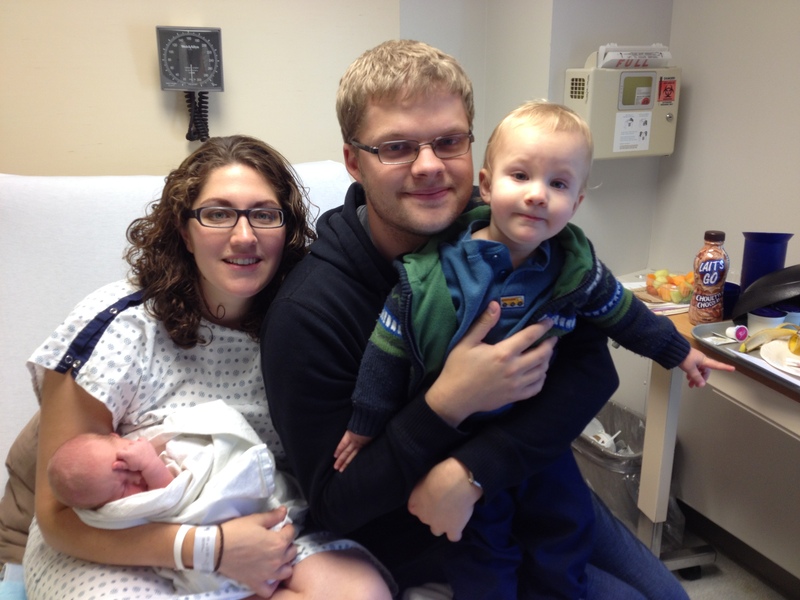 I delivered Calvin on a Friday nightand would have gone to church two days later had I been released from the hospital. I enjoy other people holding my babies and exposing them to germs. I don’t want to hole myself up in my home just because it might be acceptable because I have a newborn and need time to heal. If I need healing time, I can still sit on a couch at somebody else’s house. And even if I didn’t want people to hold my baby, I would keep it in the seat or wear it in a sling, but still visit people. Our baby will be here soon! 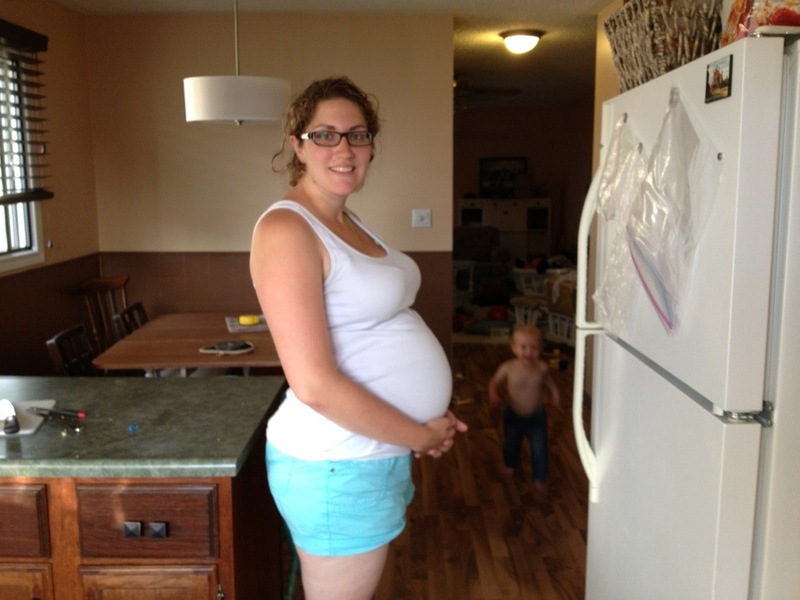 This entry was posted in Life and tagged baby #2, pregnancy on October 1, 2013 by Larissa Sevenhuysen. 33 weeks brings me well into my third trimester. The third trimester for me has meant I get my mild acid reflux a bit more often and a couple charley horses. Well, one real one. Then somebody told me about putting a bar of soap in your bed and when you feel one coming on, just reach for it with your foot and the pain will stop and not get worse. Well, the next time I felt it, I didn’t have a bar of soap, but I found the corner of the bed with my foot. And the pain stopped before it got bad! Way better than trying to stretch it out during the pain which really does nothing and you hurt for a couple days after. Other than that, I have learned that my hips and tailbone hurt less when I turn over in bed if I don’t put a pillow between them. I discovered this during Tim’s work trip when one of the hotels only had two pillows in the entire room. I still use one now to support my belly, but I just don’t put it between my knees. My doctor appointments, which are every 2 weeks now, are quite boring. I am measuring “beautifully” and my blood work comes back looking “gorgeous” and I have nothing ever to ask my OBGYN. We listen to the heartbeat, Calvin says “wow!” and then we go home. Nice and quick! So now we have less than two months to go! I just have to sort through my newborn stuff and set up the pack and play in our room. And I guess I have to pack a bag and stuff too. Fun! This entry was posted in Life and tagged pregnancy on August 29, 2013 by Larissa Sevenhuysen. 26 weeks now. That means I am just about in the third trimester! That is quite exciting to think about. 3 more months of being pregnant. 3 more months of being a mom to just one. 3 more months to wonder how having a second will affect me and the way we do things. I am feeling quite well these days. My prescription vitamins are doing their job and getting me good amounts of iron I’m guessing because I am feeling more energetic again. It’s getting a little tougher to pick up Calvin’s toys off the floor. I really only feel pregnant when I go to bend over. Or when I am doing stuff at the kitchen counter. My stain remover has seen lots of use lately! I think I am starting to feel the need to nest! Today I felt like tidying up the living room during Calvin’s nap, even though I knew it would be a mess again within an hour of him waking up. I suppose I could put these energies to better use and start packing some boxes though. We are busy looking for a place to live. We haven’t quite nailed down a place, but still hope to be out of here in the next 2-3 weeks. I’ll keep you updated. 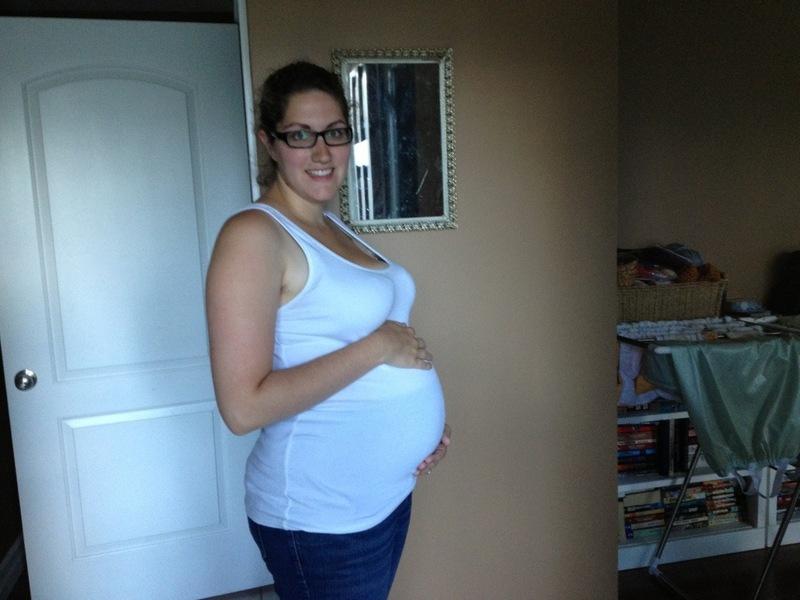 This entry was posted in Life and tagged baby #2, pregnancy on July 15, 2013 by Larissa Sevenhuysen.